Polymethylmethacrylate (PMMA) is a thermoplastic material with qualities similar to glass: it is rigid, transparent with exceptional clarity, good resistance to weathering and chemicals, has good mechanical properties, and is fairly resistant to impact and scratches. Versatile and easy to work with, it is produced in sheets of various thicknesses and in bars and tubes. It can be used for making design objects, for communication, but also for building technical parts. PMMA is traded in a wide range of sheets, either extruded or cast, with thicknesses varying from 2mm to 15 mm. They can be transparent, translucent, anti-glare, coloured* or mirrored*. PMMA can also be produced in transparent blocks of greater thickness, from 20 mm to 200 mm, in tubes as well as rounded and square bars. Easily workable, PMMA sheets can be sectioned, laser cut, perforated or milled in order to obtain any shape required. Methacrylate can also be hot bended, thermoformed and glued to obtain a wide range of objects (cabinets, display racks, shelters, etc.). Turning, polishing and other finishing operations allow a whole series of special items to be produced. *Materials on request, only available in certain thicknesses. CN (cast) and XT (extruded) sheets have dissimilar physical properties and behave the same in regards to natural aging. The differences concern the most sensitive thermal and chemical properties and in particular the response to certain processes. In particular, XT has a melt flow significantly higher than CN, making it more thermoformable and allowing a much more detailed reproduction in cases of delicate mouldings. CN sheets on the other hand have a surface quality, flatness, and a higher optical purity than XT sheets, but a greater tolerance on thickness. The sheets come in an almost unlimited range of thicknesses. 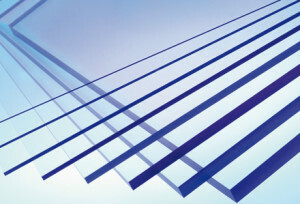 Colourless Plexiglas® bars and tubes are suitable for both technical and decorative applications. The tubes are supplied in bars of a diameter from 5 to 500 mm, in variable thicknesses while round bars are available from a diameter of 2 mm to 100 mm. The PMMA sheets are easy to process. In addition to cutting to size, LPT has high tech equipment such as laser cutting systems, which deliver the most varied shapes with exceptional accuracy and finish. Milling and polishing by fire or diamond give surfaces a shiny appearance. The hot bending and bonding procedures and finishing help create products of great appeal. PMMA may be the solution for many application needs of planners, architects, businesses and consumers: from prototype to mass production. A competent technical consulting service is offered to the Customer for developing the product. At the request of the Customer, support for the feasibility and planning study of articles for marketing and point of sale. Among the most common applications: counter displays and display elements for stands, display cases, items for merchandising, logos and letters for signs, displays and decorations. Home furnishings, battisedia, parapets and mechanical parts.